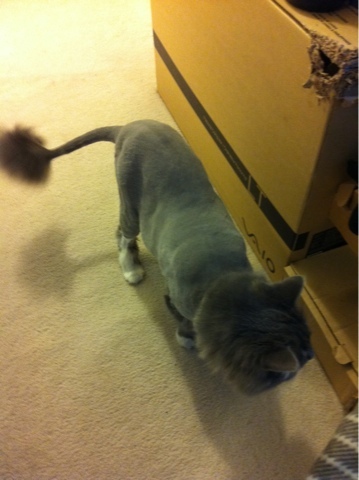 Last Saturday I brought my cat, Cheesecake to "The Groom Room" for lion cut. I was pretty excited for Cheese because I've never seen him being all shaved up. It was basically for my own entertainment purpose (I know I m an evil person). So this is my cat's "before" look. But on the other hand, I brought Cheese there because he's getting too furry and all tangled up! Since this was my cat's first time getting the lion cut, the store owner (Jay Jay) told me that after getting a lion cut, I would have to come back every 6 months. Hearing that, all I can see is money flying away from me. haha. 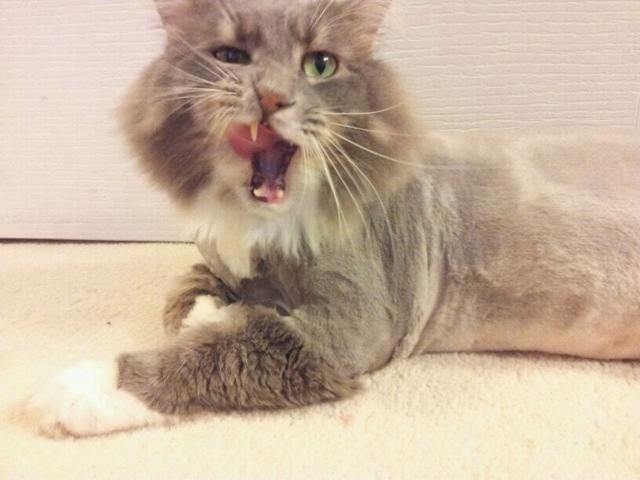 I just got my furrball shaved 3 days ago for the first time. She was so matted, I didn't want to pet her. She's acting cold since the cut so I got the heating pad out for her. I think she's not used to walking around in her underwear. Poor girl. 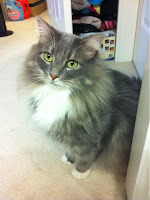 LOL BTW, Cheese looks just like one of my other cats, Gracie (green eyes and all), who never mats. Go figure. Awwww...! the groomer from Groom Room told me some of the cats would act that way after having the lion cut. It just takes time for them to get use to not having that much furs. What my family did was always pet cheese and tell him how pretty he is with his new "hair cut". Which kinda helped and he is pretty pleased about his haircut. Give it a try on that! On the bright side, at least your cat won't be coughing hairballs now. LOL.